Size: 2nd largest of all cockatoo species the Moluccan is a very large bird with showy peach colored feathers. Like many of the large parrot family members the Moluccan cockatoo is monomorphic. Rain Forest Facts: This bird possesses a beautiful crest that is curved to the rear, a highly intelligent and friendly bird, the Moluccan is often the favorite keepers who get to know these wonderful animals. Status in Wild: Declining due primarily to loss of habitat. The cockatoo (of the family Cacatuidae) is one of the most well-known birds in the parrot family because it’s quite noisy; in fact, it’s the loudest of all the parrots. Their loudness comes from a history of having to communicate long distances with one another in dark, thick forests. 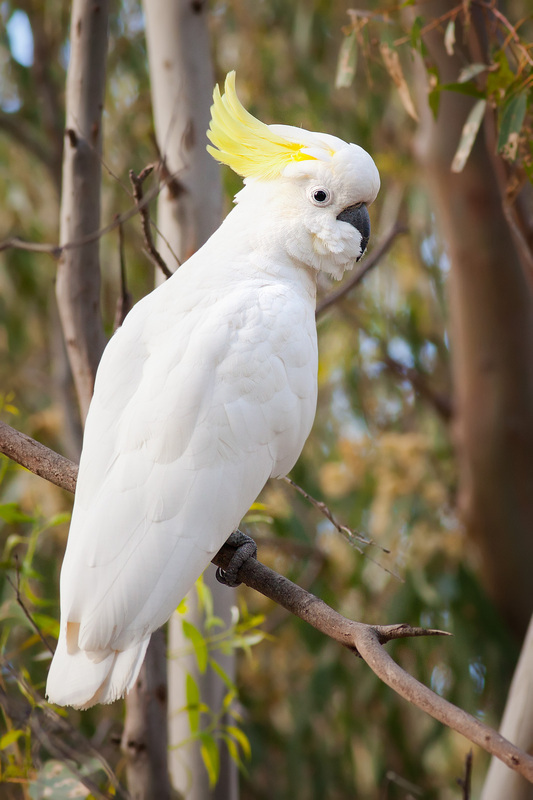 Cockatoos are found in Australia and some surrounding islands, mainly in forested areas. These birds form flocks, with sometimes up to three different types of cockatoos, to feed together on berries, nuts and seeds. Most cockatoos even stay in the same flock they were raised in and often mate in long-lasting pairs. Like all parrots, cockatoos are zygodactyl, which means they can use their feet to grasp objects, making them excellent climbers. Although parrots are often colorful, most cockatoos are actually black and white because they lack a certain texture in their feathers that reflects light. In the 1970s, many cockatoos were trapped for the pet trade and their numbers in the wild have decreased dramatically. In fact, some Indonesian cockatoos are now thought to be extinct in the wild. - Cockatoos can live for 40 to 60 years and sometimes longer. They have been known to live over 100 years in the zoo. - The Palm cockatoo’s beak is so strong that it can crack Brazil nuts with it. Philippines: power plant threatens rare cockatoos The Philippine cockatoo is facing extinction. Only around 1,000 of these magnificent birds remain, and the largest population can be found on Rasa, a tiny island just off Palawan in the Philippines. This location – of all places – has been chosen for a coal power plant. Please urge the Philippine authorities to stop the plans. Screeching raucously, a flight of endangered Philippine cockatoos crosses the narrow strait that separates the tiny coral island Rasa from Palawan, a much larger island and the birds’ feeding ground, for Rasa is too small to support the population. This vital route could soon be blocked by a coal-fired power plant that DMCI Power Corporation intends to build on the coast of Palawan. Environmentalists are speaking out against the plan: “Policymakers are trying to give Palawan a green image and promote the island as the last ecological frontier of the Philippines. Yet approving a coal power plant in such a highly sensitive area and putting the survival of an entire species at risk is a crass contradiction of those efforts,” explains Peter Widmann, vice president of the Katala Foundation. The decision by the Palawan Council for Sustainable Development ignores the submitted environmental studies and the will of the municipal government, and of the residents of Barangay Panacan. About 260 Philippine cockatoos live on Rasa Island, making it the largest population in the wild. Only 30 years ago, the birds inhabited virtually the entire Philippines. Today, the IUCN Red List categorizes them as critically endangered. Only an estimated 1,000 birds still live in the wild in the Philippines. The imposing birds have numerous enemies: logging, agriculture and mining are destroying their habitats, and the illegal animal trade poses a grave threat to their survival. Poachers plunder almost every unguarded nest in the wild and sell the young birds as decorative pets. Lifecycle Unlike other cockatoos, the palm cockatoo does not congregate in large flocks; it roosts alone, feeds alone or in pairs and rarely forms groups of more than seven. HABITAT In Australia, the palm cockatoo makes its home in the eucalyptus forests of the Cape York Peninsula and the rainforests of the Aru Islands; in New Guinea, it populates the dense savannah woodlands in the northern and western sections of the island. Palm cockatoos inhabit wetter, warmer climates than most other cockatoo species and usually perch in leafless branches. Mating pairs maintain territories with several good nesting trees, which they check on periodically during the year. CONSERVATION The population of palm cockatoos is diminishing. In New Guinea the bird’s rainforest habitat has been reduced due to logging; people also hunt the birds for food and capture them so they can be sold in other countries as pets. In Australia the palm cockatoo is protected and listed in Appendix I of CITES, yet many of these popular birds are smuggled out of the country each year. BREEDING Young palm cockatoos demand constant and attentive care, so adults form strong pair bonds and share parenting duties. Since they pair for life and remain close together throughout the year, courtship rituals are kept to a minimum, with only courtship-feeding the rule.Together the male and female regularly inspect theirterritory for potential nesting sites.The ideal home is a hollow spot in a tree, 10-25′ above the ground. Once they choose a site, they’ll use it year after year, constructing a nest by shredding twigs and dropping them into the hollow (left). Both parents incubate the single egg for about 30 days. Then the chick begins the difficult and exhausting hatching process, which can take 3-4 days; it finally emerges without down. The chick will stay in the nest for between 100-1 10 days, longer than any other parrot species. It will be two more weeks before the young cockatoo is ready to make its first flight. Pairs mate for life; their first task as a mating pair is to find a safe, hollow tree in which to build their nest. After a 30-day incubation, the female usually lays a single egg. Chicks remain in the safety of the nest for up to 110 days. The two birds work together to build a nest by gathering sticks and then shredding and dropping them inside to form a platform. A young cockatoo is demanding: both parents work to feed and care for their offspring until six weeks after it leaves the nest. FOOD & FEEDING The humid rainforests offers the cockatoo an abundance of nuts, fruits, seeds and grubs. The bird shells and eats nuts efficiently: first, it husks the nut, turning it with its tongue while working the shell off with its beak. Then it splits the nut in two, storing the halves in its lower mandible. With a cache stored, the bird can push pieces forward with its tongue, split them on the edge of its lower beak and throw them back with a quick toss of its head, to be swallowed. Males sometimes exhibit a curious courtship behavior: they hold small sticks in their claws and drum on a hollow log. Cockatoos appear to be playful birds. They have been observed flying at one another, trying to knock each other from their perches. BEHAVIOR ‘aim cockatoos roost separately, but call to each other after sunrise. After a brief foraging trip, a relatively small flock gathers in neutral territory. There they preen, display and interact socially. Long flights are usually necessary between roosting and feeding sites; the group disperses and often meets again at a convenient tree. At sunset, pairs leave the group and return to their own territories. After making a round of the nesting area, the two birds each roost separately. 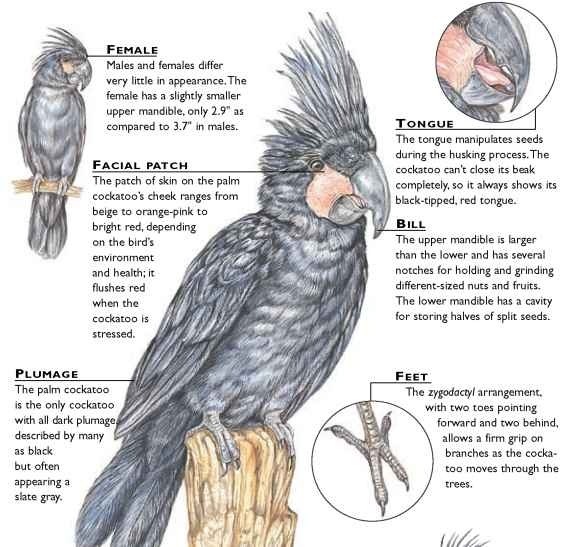 If predators or other birds intrude, a palm cockatoo stamps its feet and its facial patches blush a deep crimson. Profile Palm Cockatoo With its broad tail and impressive, fanlike head crest, the palm cockatoo appears quite large, but it’s in fact relatively lightweight. Male 1-2.5 lbs. ; female 1-2 lbs.